2) They’ll have some relation to what we do here at NASA. That is a bunch of atoms arranged in a particular way. Looks like the track of a moving rock found in some dry lake bed. The trak is made by rocks that move when the lake bed is muddy after a rain and a strong wind blows the rocks accross the ground. Looks like a dry lake bed with car or wagon wheel marks scratched in the hardened surface. It’s the trail of a rock that moved across the desert in times of precipitation. It’s a track of moving/sailing stone in the dry desert. Two famous place for this are in Racetrack Playa and Death Valley. It is the result of a rock that had been submerged in a temporary lake in a desert valley the surface of which froze (presumably over night) thus entrapping the rock. Due to a uniquely slippery quality of the mud in this particular valley coupled with particularly strong winds acting on the ice sheet, the rock was dragged some distance across the desert floor generating this “trail.” As the sun came up the valley warmed, melting the ice and eventually evaporating the water leaving little evidence, but for the above pictured phenomenon, that any of these amazing events had taken place. Cheers! Looks like Death Valley Racetrack Playa. Looks like the dry beds of the Great Salt Lake. It looks like the dried beds of the Great Salt Lake in Utah. Just saying….. 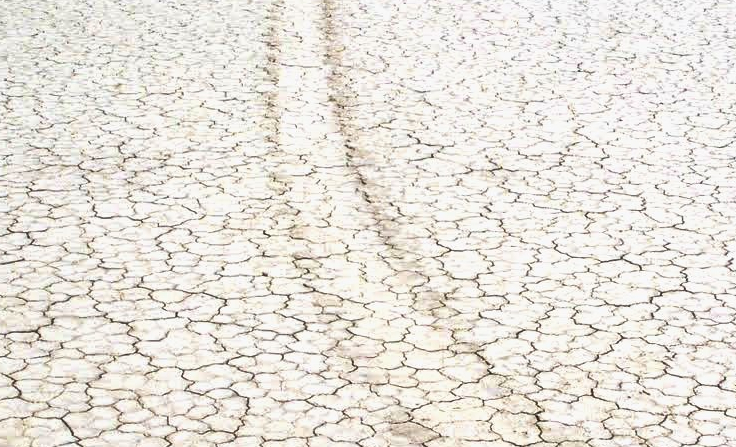 I would say mud cracks caused by extensive drought revealing bed of lake/pond. The tracks are possibly ATV trails or aforementioned rock “sailors” :). These are rover test tracks through a dry lake bed here on Earth.